As businesses start sharing their year-end financial results, one hemp-CBD company hopes to show a breakout year by riding the wave of momentum from 2018. Earlier this month, CV Sciences (OTCMKTS: CVSI) released their financial results for the fiscal year ending on Dec. 31, 2018, posting record growth in both revenue and retail distribution. In 2018, sales grew by 133%, from $20.7 million in 2017 to $48.2 million. Quarter by quarter, the company’s sales have continually risen over the past two years. In the first quarter of 2017, CV Sciences generated roughly $3.7 million in sales; by Q4-18, quarterly sales had nearly quadrupled (3.8x). Indeed, CV Sciences finished out the fiscal year with a particularly strong fourth quarter. Year-over-year sales for that period increased from $7.2 million in the previous year to $14.2 million, representing a growth of 96.1%. The company attributed its rise to a combination of growing brand awareness and increased demand for the company’s PlusCBD products. One of CV Sciences most popular product lines is PlusCBD Gold, which contains high concentrations of CBD instead of a mixture of CBD, CBDA, and other hemp-derived cannabinoids. Operating income for the year rose to $10.2 million, roughly equal to 21.2% of net revenue. In contrast, CV Sciences in 2017 experienced an operating loss of $4.9 million. 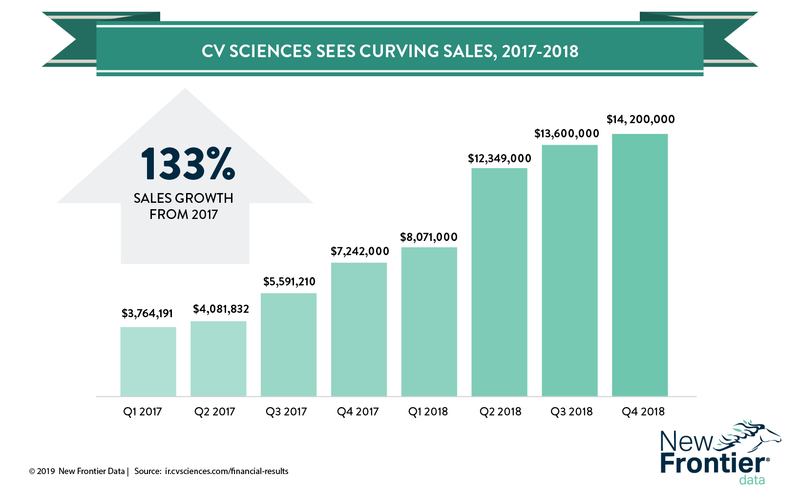 Another contributing factor to the company’s rapid growth in 2018 was its expansion in retail distribution: Over the past year, the number of retail outlets carrying CV Sciences products grew by 45%, increasing from 1,548 stores in 2017 to 2,238 stores nationwide. In the fourth quarter alone, the company added 145 retail stores to its distribution network. The company also reported steady progress in its drug development program. Later this year, CV Sciences plans on filing an investigational new drug application for its lead drug candidate CVSI-007, a CBD-and-nicotine formulation designed to help individuals stop using tobacco products. In the short term, CV Sciences’ strong results sent its stock up by 2%, from $5.00 per share to $ 5.11. However, those gains have since leveled off, with the company now trading at around $4.99 per share.